In a city littered with ramen shops, could another type of Japanese noodle be finally taking over? This seems to be what Marugame Udon, a popular udon chain from Japan, is hoping by setting up shop on the sixth floor of i-Square. 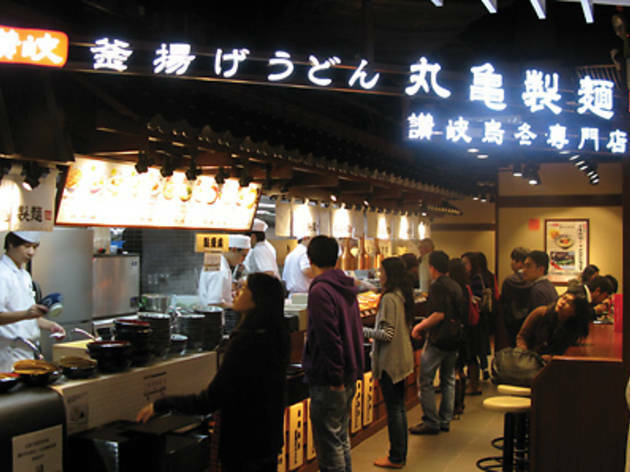 Located on what is presumably the noodle level, facing off with Pho 24, Praise House Congee and Noodle Cuisine, Hokkaido Ramen Santouka and Te Quick Pasta, Marugame’s narrow entrance belies the rather spacious seating area that exists past the cashier counter. 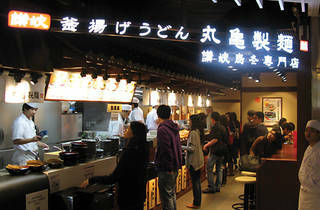 We’re first enticed to the shop with the open kitchen, where we’re able to catch the udon-making-action from scratch. The flour goes through a noodle-cutting machine and is then drenched in scalding hot water. Then, it’s proportioned off according to bowl size. There are 12 udon flavours and two sizes available to pick from. The broth you select is poured over the bowl of udon and handed to you over the counter by smiling servers. You move on and select some choice tempura and omusubi/onigiri items to pair your noodles with. Cut scallions, tempura flakes and various sauces are also available for extra seasoning. Shop 609, 6/F, 63 Nathan Rd, Tsim Sha Tsui, 3583 0880. Dinner for two: Around $150.